Painted 29 GA. 40 Year Metal Roof. 8” Groove T-111 Exterior Wood Siding. Overhang boxed-in w/ white vinyl soffit w/ fascia trim: 12” Sidewalls, 12” Gable Ends. Doors: (5)- 4’x7’ Wooden Split Dutch Doors_ (1)- 36” 9 Lite. Non-Insulated Split Sliders: (2)- 12’Wx12’H Split Sliding Doors (2 – 6’ Sections). T&G Boards 12’ High on Interior & Exterior. 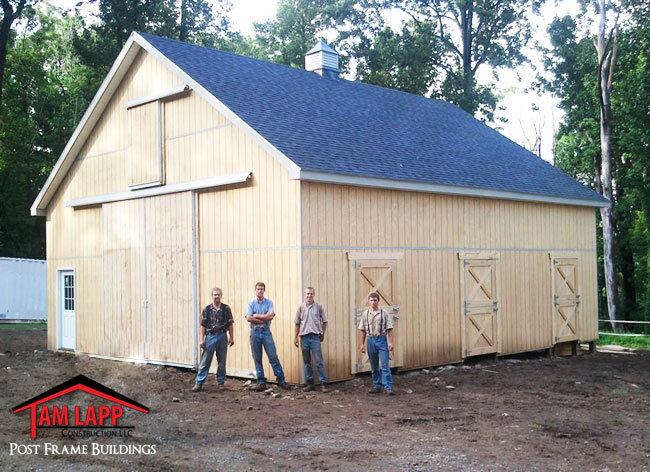 Tack Rooms: (1)- 11’x12’_ 2×8 T&G Boards 12’ High on Interior & Exterior.